The MPE-65 doesnt really have a focus ring -it is always focused at the maximum magnification that you have it set to and there is no infinity focus. No auto focus either not that it would really do you any good anyway. The depth of field is so thin when shooting at life size and higher magnification that you wouldnt want the camera to decide whats in focus and whats not. One of the reasons why I tell people to stop centering their images, other than the obvious compositional mistake, is that the focus indicators in the view finder don't work when the MPE-65mm macro lens is attached to any Canon camera body. So you have to be good at focusing the scene with nothing to aid you other than the image you see in the view finder. I try to key off of textures like hair, scales, etc. If you are using a standard macro lens now then get use to focusing it without using the focus indicators in the view finder -it will make moving to the MPE-65 a lot easier. There is a ring on the lens that controls a variable length extension tube, and as you turn it you can go from life size to five times life size and every magnification in between. So you will only be shooting macro with it -not possible to get a shot with a lower magnification than life size. If you look closely at the design of the MPE-65 it's really a reversed lens with a variable length extension tube built into it. The advantages: No need to add or subtract anything from the lens to change the magnification all you have to do is turn a ring. If you've ever juggled a lens and tubes out in the field you'll understand how easy it is for the MPE-65mm to spoil you! Image quality is on par with "L" glass -I do very little editing, less than two minutes for any single image, and I can get the colors to "pop". The lens is also razor sharp so sharp that a lot of people have wondered if the MPE-65 is better at controlling diffraction than other lenses. But as good as the lens is it cant undo the laws of physics. What some people are calling diffraction in other macro lenses is really due to the lens not producing a sharp image circle or what I call macro motion blur movement during the duration of the flash that is only the equivalent of one or two pixels in length on the sensor. Not enough to be easily detected as motion blur, but enough to cause the image to look a little soft. The MPE-65 is so sharp that you can use it at F16 up to twice life size, and up to F11 all the way to five times life size and still get sharp images (depending on the size of the subject). I often shoot above 3x at F14 because opening up the lens 1/3 of a stop to F16 makes a noticeable difference in image quality. IMHO the MPE-65 has difficulty producing a sharp image circle at F16 above twice life size, but I dont think the problem is related entirely to diffraction (opening up the lens 1/3 of a stop shouldnt make a difference in diffraction softening). You can attach the MPE-65mm directly to Canon's 1.4x and 2x teleconverters for a maximum magnification of 7x and 10x respectively. But the lens won't communicate accurate aperture information to the camera, so keep in mind that you're actually shooting one Fstop higher than what the camera is displaying with the 1.4xTC and two Fstops higher with the 2xTC. On the plus side the short working distance allows me to grab onto the flower an insect is feeding from with my left hand and then rest the lens on that same hand to help keep everything steady. The image included with this deviation was made possible by the MPE-65mm's two inch (5cm) working distance at three times life size. A guid to Canon's MPE-65mm macro lens. I LOVE my MPE65 now, has been sitting unused for a couple of years before I decided it cost too much to be left in the lens draw. You are so correct on the steep learning curve, thus its time in the dark place. Initially and still recently I only used it as an inside “kitchen table” studio one. This then necessitates a tripod, focus light, macro ring flash and a focus slider. Not to mention a kitchen full of escaped bugs to scare arachnophobic visitors. All too cumbersome for the outside I thought. Then saw your pics on Flickr and decided what the heck. Last couple of days I am amazed what can be done hand held in the garden with this lens. I discovered your “left hand brace” pretty quickly : ) as it is a big lens .. the pics are amazing! My 100mm 2.8L is now a thing of the past except for underwater. Cannot knock the inside setup for this lens either, it’s brilliant. The EF-S 60mm is also an excellent lens, and works really well with the Left Hand Brace Technique because the working distance is really short (like the MPE-65mm it's about 4" at life size magnification). Thank you for this review. I have a great interest in marco photography. What DSLR would you reccommend for this? As I have yet to buy one. . . . I won't get the MPE quite yet, I was just planning for the future! Thank you. p.s I was thinking about the 450D. I have an Nikon D40 and a Sigma 70mm 2.8 1:1 macro! But one day I'll buy a canon and this lens! Excellent article and this is one lens I'd like to have. Right now I'm using a Sigma 105 mm Macro on a Canon 40D. Do you normally use a flash? I'm asking because I know from personal experience how quickly the available light decreases when you shoot at higher magnifications. I constantly have to juggle the ISO speed, shutter time and F-stop, just to make sure that I get a shot that's decently exposed, not blurry and which has more than a paper thin DOF! The only time I do not use a flash is when I'm shooting at life size and I'm using the depth, or lack of it, as a compositional tool. Nearly all of my macro is with a flash, the MT-24EX with a custom diffuser that I made for it. The harm is 140 € less to put down for the MP-E. But I might do it anyway. Can't wait that long. I will get it one day, as soon as my budget allows. Which might be a while as I've just finished uni and need to get a job first . Meanwhile I'm trying out all the "poor man's macro" options. Right now, it's lens stacking. Wow...great results! Thanks a lot for the link. I've only stacked my standard macro lens with a reversed 50mm, 17-70mm and now a 24mm. The last one (Canon FD lens) has an aperture ring but it doesn't seem to work when the lens is not on the camera. It's somewhat stopped down and I can't get it to open up completely so I get some heavy vignetting. I asked Jody if he has a gallery with his macro work, but he hasn't gotten back to me yet. I'll post a link in my journal when he does. You are making me question putting money down on my kenko extension set to go with the 100mm. Should I drop it all and get the mpe-65??? It's a good idea to get some practice with a standard macro lens + tubes before you get the MPE-65mm. The lens costs around $800 USD. Someone told me that the MPE got more deph of field than a reversed lens.. is it true ? i cant believe it, caus the mpe is build the same technique. so im quiet happy with 18mm reversed + extension tubes ^^. 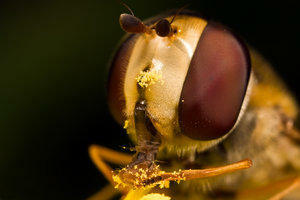 do extension tubes worl with the mpe ? I'm pretty sure that depth is just a function of magnification and aperture, so at the same Fstop and mag two lenses will give you the same depth of field. I think the MPE-65 is better at producing a sharp image circle at 1x to 5x and people often confuse it with an increase in depth. Extension tubes are almost useless on the MPE-65 -not much gain. If I want to go above 5x I add a teleconverter. hm, why does extension tubes work great on a reversed lens but not on the mpe ?